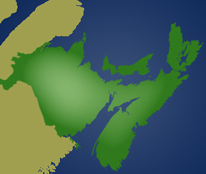 The Coastal Community-University Research Alliance (Coastal CURA) hosted a conference from June 26-29, 2011, focusing on the inclusion of resource dependent communities, including Aboriginal communities, in processes of spatial planning, integrated management and natural resource management. In addition to resource-based and aboriginal communities, the meeting was attended by government representatives, universities (academics and students), community based management and networking organizations, civil societies and NGO's, and small scale natural resource industries – all those interested in finding ways to engage together to better manage natural resources. 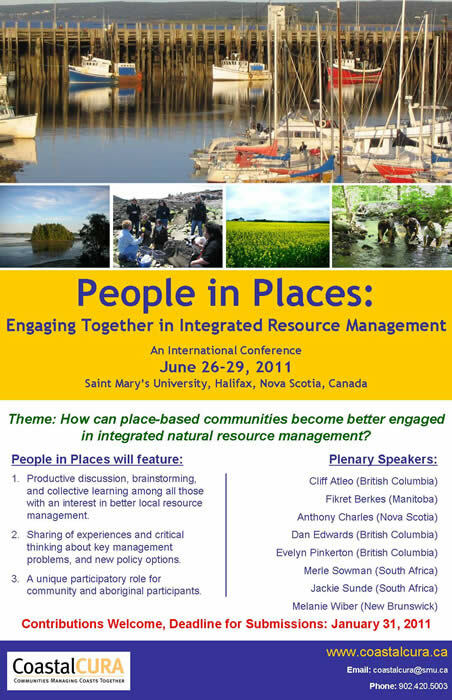 Conference Overarching Theme: How can place-based communities become better engaged in natural resource integrated management? The focus of the conference on “People in Places: Engaging Together in Integrated Resource Management” reflects the Coastal CURA emphasis on building knowledge and capacity to support community initiatives and community involvement in managing coasts and oceans, and specifically to support the ecological, social and economic well-being of place-based communities, through cooperative research and capacity building, and through building community-oriented governance of local natural resources. A key goal for the 2011 meeting was to achieve a synthesis of what we have learned over the past several years, by engaging with others from around the world who are dealing with similar issues. The “People in Places” conference promoted productive discussion, brainstorming, frank exchanges and collective learning among all those with an interest in better local resource management. The focus was on sharing experiences to promote collective learning, critical thinking about key management problems, and creative thinking about new policy options. The meeting balanced attention to spatially-defined resource management (e.g., oceans, watersheds, and coastal zones) and sectoral resource management (e.g., local fisheries, community forestry, wildlife management). For more information on conference presentations and key outcomes, please visit our online proceedings webpage.